Sheana Firth of Breakaway Graphics approached us to create a website that properly reflected her graphic design aesthetic and style. 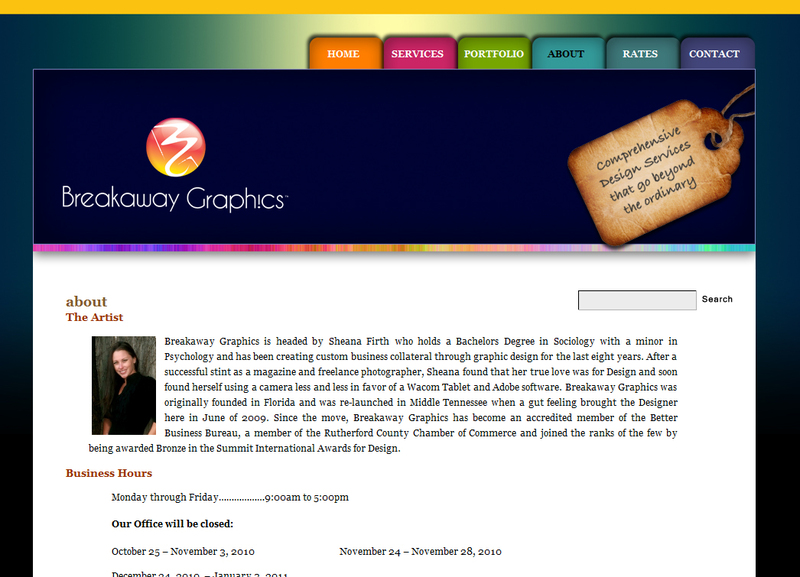 We were happy to help this talented designer bring her work to the web for her clients to see. She’s a joy to work with and if you’re in Tennessee and you need a graphic designer you should definitely look her up. Thanks for everything you do, Andrew! Without a doubt, http://www.breakawaygraphics.net owes it’s exceptional functionality and flow to the specialists at Splint Media who took our ideas, improved upon them and executed the site flawlessly and did so happily, I might add! Heaven knows us print folk need web gurus like Andrew and Splint Media to help us get our designs web-ready. Without you we would not have a platform to show the world our work! Thank you!